I am so lucky when it comes to cycling partners! Anyone who can’t let go of Lance Armstrong as a cancer-beating inspiration should just look closer at people around them. Chances are there are loads of amazing people you know who have overcome (or are overcoming) some serious troubles and are still such nice non-bullying folks to keep company with. Hugo climbing Presidio Dr in Old Town San Diego. On Sundays I ride with my friend Hugo. He survived falling off a 5 story building he was working and broke every vertebrae in his back. Hardly anybody believed he would ever walk again. He spent a long time recovering and gained a lot of weight until he decided to pick up cycling a bit over two years ago. Since then he has shed more weight than me, my bike and backpack combined and rides his bike 40 miles everyday. He even comes out to ride Mt Soledad with me sometimes… Hugo still weighs over 260 lbs and we rarely go up the mountain the ‘easy’ way, but he never whines or complains. He just puts his head down and keeps on pedaling until he gets to the top. 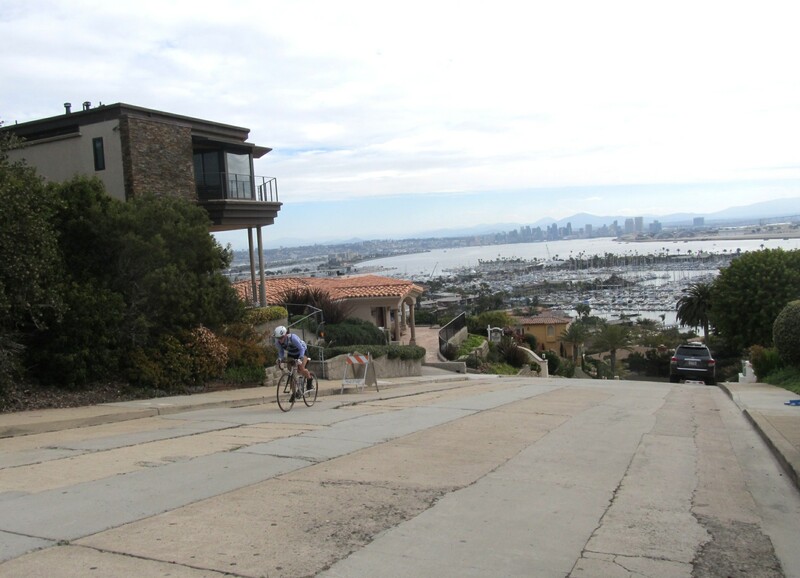 The Vzrd conquering spiky Lucinda St in Pt Loma. 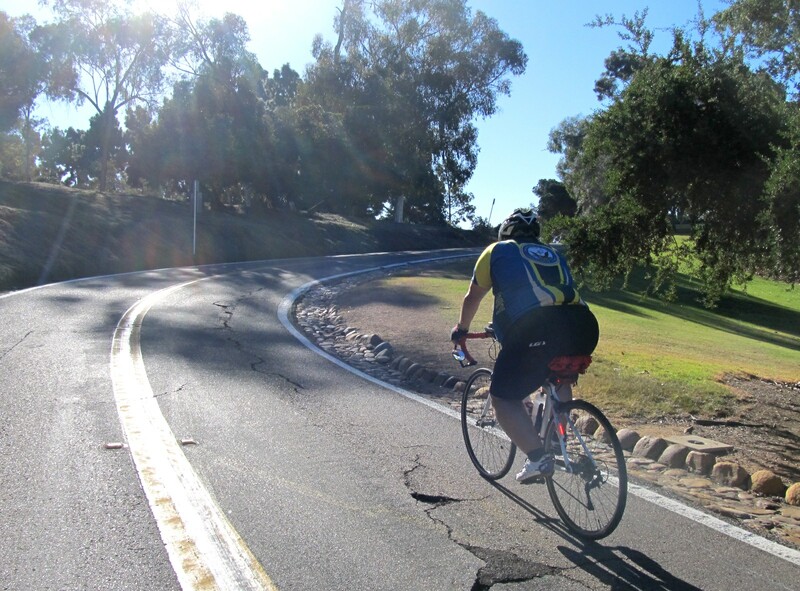 D AKA The Vzrd, the lass I met last week and with whom I rode up and down Pt Loma with this morning is the same way. She survived malignant melanoma twice and lost quite a bit of her lungs to it in the process… Now she’s training for the Savage Man Triathlon (it raises fund for melanoma research). That’s a really hard race that involves cycling up beastly Westernport Wall (if you don’t know what that is, go search for it on Youtube… it’s really really steep) and followed by running. Anyhow, The Vzrd is just like Hugo; no whining, no complaining. Whatever nasty wall I take her up, she wheezes her way to the top and whenever I give her a choice of either continuing up another wall or taking a much milder round-about route, she goes for the tougher choice…. and gets so happy when she crests the climb. My cycling heroes aren’t the fastest climbers or sprinters I’ll never meet in real life, but folks like Hugo and the Vzrd and I’m sure many more who do things everyday that their doctors never thought they would be able to do. And they go about it nicely and quietly, too, appreciating all the little triumphs along the way without sweating small stuff. I’m really a lucky gal to know and ride with them every week! I find that I cannot ride straight up Mt. Soledad, or Mt. Helix, of even the short 200-foot climb up the hill by my house. I have to do a lot of switchbacks. Sometimes it seems I’m riding 200 miles in order to get up 200 feet! Hey, as long as you get to the top, it doesn’t matter if you rode straight up or did a thousand zigzags in my book! 😉 I still have to zigzag up things like the last block of Apple St in Dictionary Hills myself. The view from the crest is almost always worth it, tho.